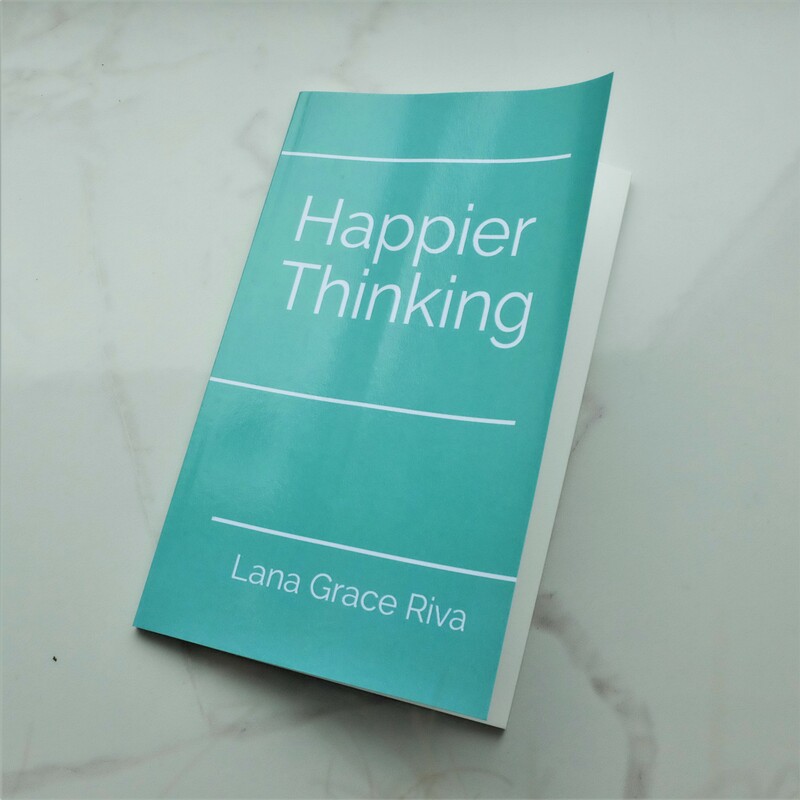 This book, Happier Thinking, was sent to me by Lana herself, after reaching out to me via email to discuss if it would be something that interested me. If it is something that is of interest to you it is available to purchase on Amazon to purchase in paperback or download on the kindle if having all your books in the palm of your hand, providing discretion from fellow commuters, is more your style. There’s often an undercurrent of mental health chat flowing through my blog, social media and daily life chats and I was interested to find out what tips or tricks might be included in this book or, despite the author experiencing darker days herself, if it would come across as one of those ‘just get on with it’ style write ups. Something that might be represented under the category ‘self-help’ book makes me incredibly nervous. There’s a risk of it telling you that something you have spent your life doing is wrong, that you need to sweep everything out of your closet and start again or that all the people in your life are irresponsible for letting you get this way and can’t really care about you. Luckily this 50 page book does none of those things and instead makes you feel at ease with a written format that feels like a friend is offering you a few tools to get out of your current place but willingly acknowledging that the ladder might work better for you than the rope, or vice versa, in climbing out of the hole you’ve found yourself in. Before I talk more specifically about the contents of the book I just wanted to quickly highlight that the colour of the book cover is wonderful. Blue can sometimes feel like quite a cold and harsh colour that brings my mood down a notch but this turquoise tone of blue feels peaceful and tranquil in a way that allows you to look at it and feel confident about stepping into it like dipping your feet into the sea for the first time on holiday. Lana describes this book by saying, via the description, “changing how you think is possible. I wasn’t always so sure that was true until I experienced it myself, but I know now we don’t have to just accept unhappiness. Not always anyway. This book is my collection of tips and suggestions that have helped me achieve happier thinking. It’s sort of a gym for my mind. I’d love to tell you it was easier than the real gym but well… it’s not really. It takes time, effort, and practice but it’s absolutely well worth the rewards” and this snippet of her viewpoint makes it really clear that this isn’t some quick fix book to happiness and seeing rainbows everywhere. Right at the very start Lana also points out that she isn’t trained in any area of psychology or mental health and that everything mentioned is just her own perspective and techniques that have helped her in the past; this is not a one size fits all sort of book and it isn’t intended to be either. Some of the tips, tricks and thoughts in this book may sound really obvious to you or you are able to sit there and say you already do that but to another person it could be a complete revelation so when that happens it doesn’t mean the book will be completely pointless to you or you already know it all so there is no need to carry on. Even if you do happen to know all these things, if you are reading this book you are seeking some kind of further happiness in your life, and it could well serve as a reminder of things and put you back on track with some habits that work for you. For me I know making lists work regarding big tasks that need completing and putting them in a priority order, I know jotting down something good that has happened during the course of the day will help me to look back and feel more positive in the future and that trying to find a positive in a negative or remembering that the negative isn’t a sign of the whole day to come really works for me. There are some other things in the book that I had heard about doing but didn’t feel was right for me and then there was some tips I had never thought of before and felt that I could try to include them in my life. It’s nothing ground-breaking but it does help you put one foot in front of the other. It is a simple book and whilst short you can either whizz through it all or read one tip/chapter at a time and try to implement each one for a period of time to see what does or doesn’t work for you before adding another thing into your mental thinking routine; sometimes trying to make too many changes or have too many ideas in our head at once can be overwhelming so feel comfortable with taking it steady and at your own pace to make sure you get the most out of Lana’s words. I found the book to be a really useful read and it is something that I will pop my head back into now and again to remind myself of a different approach for a certain situation or even just to remind myself that I’m not alone with struggling regards something specific and that it’s okay to need to step make or attempt to make a change on a certain mental concept. *Whilst this book was sent to me to review, all thoughts and opinions are my own, truthful and not in any way influenced by the kindness of the author for reaching out to me. They did not specifically ask for a blog post on the book but I am doing one to expand on my initial thoughts that I provided on Goodreads. This entry was posted in Books, Culture and tagged approach, approach to life, book, book blog, book blogger, book bloggers, book review, Books, happier thinking, happy, Health, indy book, lblog lblogger, lbloggers, life, Lifestyle, lifestyle blog, lifestyle blogger, lifestyle bloggers, mental, Mental Health, Pr, press copy, review, selcare, self worth, self-discovery, thinking, tips and tricks, wellbeing. Bookmark the permalink.